Crystal Clear Soapbar P-90's. 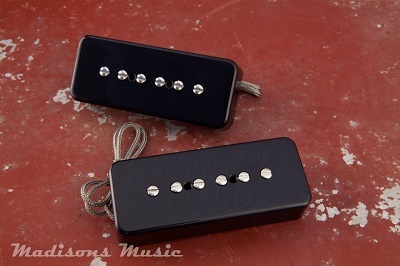 Our P-90's are wound identical to standard vintage spec. We use a 42 Plain Enamel wire, plastic bobbins and Alnico 5 magnets. Reverse wound/Reverse polarity for hum cancelling. Our hands on experience with vintage instruments gives us the upper hand to reproduce authentic vintage tone.